Welcome one, welcome all - to Beacon Design! Just like how some have their art topics, I have mine... But instead of drawing other Aetherlighters... It's producing them in a digital world! Similar to the Photo Editing competition topic, I will use professional graphic design to edit you onto a background or help out with any kind of promotional covers, banners, etc. I hope this answers any of your questions and Happy Aether Hunting! Oh, yeah, one more thing... Speaking of questions - Q&A time! Q: So, is this going to be instead of Nola A.: Case Unsolved? A: No, of course not. I hope to make my next chapter either today, tomorrow or sometime soon. However, this is for anyone who wants to be a part of this. Q: Do you have examples of your work? A: Not at the moment, but my family is experienced in this sort of thing, and I have made a shop almost just like this on Pirate101 Central, another game. You can see examples of my work here, at Skyway Design [http://www.pirate101central.com/forums/showthread.php?61617-Skyway-Design]. Q: What services are you able to offer? I understand you do designing, but how can that benefit us Aetherlighters? Q: How do the rules work? Is there a specific limit for the amount of people who you have on your list? How similar is this to a drawing topic? A: Very. This is very similar to a drawing topic. And for the rules, just go back to Skyway Design [http://www.pirate101central.com/forums/showthread.php?61617-Skyway-Design] for some basic principles. However, since we can't color-code anything on these forums, I'll just update with an @-mentioned list. I hope all this helps and Happy Aether Hunting! OK, since no one else is asking, can I get a design done soon? There's no dead line, and if someone else happens to come in line they can cut in front of me. Just let me know what I need to do . . . I'm kinda new to this whole order thing. can I get a design done soon? Hiya @Sierra_Lightspark! Yes, I'd love to! Just let me know what I need to do . . .
What kind of background would you like? Is the background in one of Aetherlight's places or a regular background? What pose would you like Sierra in? I'll also need screenshots of your character. Not sure, maybe the Flying L? Or the Resistance base ...? Ah, too many options. I'll figure it out later lol. Probably one of Aetherlight's places, but again I'm not sure. Maybe the shrugging-not-shrugging pose that happens when you first enter the wardrobe? What do you think? Oh, OK. Yup, I'll submit it very soon! Alrighty, no problem. Just let me know when you've decided. Okay, great! Would you mind providing the screenshots of that pose for me? I, unfortunately, can't tamper with your wardrobe, only mine. Bump! Anyone want to be edited onto a background of your choice, or a poster/banner, etc. made? This sounds cool! So do you draw the background yourself and then take a screenshot of a character to put on top? I'd like to see what you do for @Sierra_Lightspark's. No, I don't draw it - you, as the customer, pick the background yourself (unless you leave it up to me, hehe ). It can be either in-game in Aetherlight, or, like, a digital background. You can provide me the background if it's something regular, or you could tell me a particular background to take a screenshot of myself. and then take a screenshot of a character to put on top? Actually, I would ask if you could give me the link to your character on the Character Picture References for Artists thread, if you wouldn't mind. I can do some glowing, stylish text. I hope that gave you a bit of an idea of my work, but please let me know if you have any other questions! I'd like to see what you do for @Sierra_Lightspark's. @Nola_Applequill1 I will be submitting my screenshots shortly! Yeah, I'd like to see how you make Sierra's design. Goodness gracious. O.o That is absolutely amazing! I like the melding of the different colors. I would love it if you made me a picture! I'll start thinking about a background. For now, here's the link to my pictures. I'd like the Coat Tails suit, and perhaps the words "Arbitrary Ariella Newheart". That is an awesome font! What others do you have? Goodness gracious. O.o That is absolutely amazing! I like the melding of the different colors. I would love it if you made me a picture! I'll start thinking about a background. For now, here's the link to my pictures. Perfect and perfect! 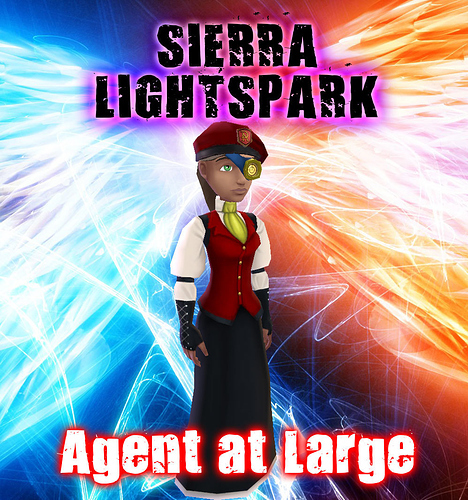 Just let me know which you'd like to use, whether in the game, a regular background like the fire-and-ice one I used for @Sierra_Lightspark, or something you'd like me to pick. Thanks! Remember, I can change the color, glow, etc. of any of the fonts. I have tons more, too. Just let me know! Why thank you . . .
Ohhh, this is cool! Could you do something for me, too? Something with the A&S Blaze font. Could you do something for me, too? OF COURSE!!!!!!! What were you thinking of? Something with the A&S Blaze font. I like that font, too! Do you have any ideas for the background, theme, etc.? Do you have any ideas for the background, theme, etc.? That was vague. What else do you want to know?